(New York, New York) June 11, 2018 – The Rokinon AF 24mm F2.8 Compact Lens is the newest addition to Rokinon’s series of highly popular full frame auto focus lenses for Sony E mount cameras. This 24mm offers outstanding image quality, a wider view than the Rokinon AF 35mm F2.8, and a fast and quiet auto focus system. cally for Sony full frame mirrorless cameras with a focus on three main features: optical quality, portability, and silent autofocus. Thanks to advanced manufacturing techniques, Rokinon now offers a wider angle view without sacrificing quality or performance. Optically, the lens is made up of 7 elements in 7 groups. Its construction has been optimally arranged for portability and to deliver high resolution from the center to the corners of the image. Three Aspherical plus two High Refractive Index elements and Rokinon’s Ultra Multi-Coating techniques are utilized to minimize chromatic aberrations and unnecessary light dispersion. Quiet, fast and accurate auto focusing make this lens perfect for stealthy street shooing. Its weight of just about 3.3oz and its inconspicuous size make it ideal for travel. A minimum focusing distance of 9.5” and a substantial wide angle of view will make this Rokinon full frame lens the go to lens for astrophotography and landscape photography. For the Sony Alpha a6000/a5000 series or other Sony APS-C cameras, its 24mm focal length is equivalent to approximately 36mm, providing the same features with a more moderate wide angle of view. 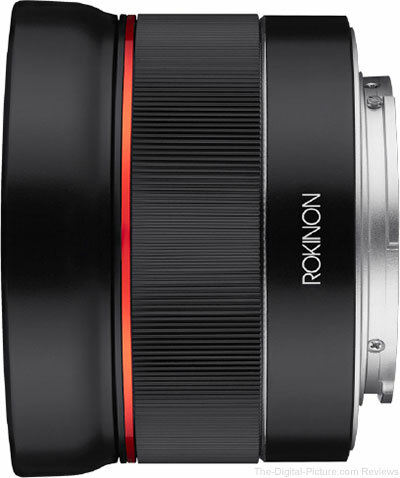 The Rokinon AF 24mm F2.8 Compact Lens for Sony E is expected to be available in July with a street price of only $399.00. It will include a reversible lens hood, lens caps, and a custom fitted case. The Rokinon AF 24mm f/2.8 FE Lens for Sony E is available for preorder at B&H.